Bassist Chris Squire is the only member of Yes who has been with the band the entire time since 1969. The group will perform Aug. 21 at the Tulalip Amphitheater. 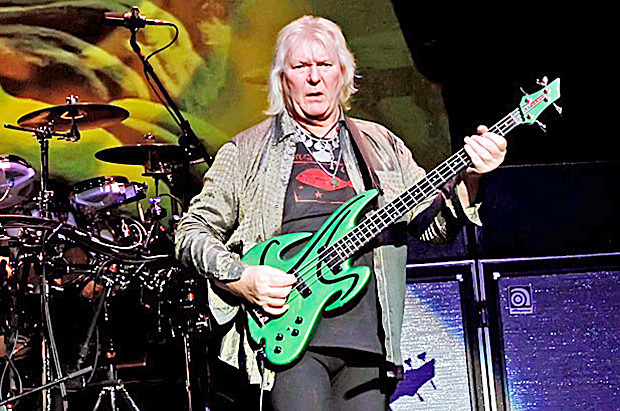 TULALIP – Despite the “Long Distance Runaround,” original bassist Chris Squire still enjoys touring with Yes after 45 years. The classic rock band Yes will be appearing at the Tulalip Amphitheater at 7 p.m. Thursday, Aug. 21, as part of their 35-stop world tour, which ends with five shows in Japan. Tickets start at $30. Squire said he doesn’t get tired of touring; it energizes him to see the varied ages in the crowd. Yes just released a new album July 8, called “Heaven and Earth,” and that’s been invigorating for Squire as well. “It’s musically challenging to play your own music live after being in the studio,” he said. On the tour, Yes is playing a couple of its new songs and greatest hits, but the majority of the show is from the older albums Fragile and Close to the Edge. Some of their best-known songs are: “Roundabout, Owner of a Lonely Heart, Long Distance Runaround, I’ve Seen All Good People and Heart of the Sunrise.” Squire’s bass is featured in “The Fish,” written in 1969 and the reason for his nickname, along with him being a Pisces. Another reason he is enjoying this tour is working with new singer Jon Davison. “We started writing music together, and it’s made life more interesting for me,” he said. The rest of the band consists of Steve Howe on guitar and Alan White on drums, both of whom have been with Yes for most of its existence, and Geoff Downes on keys. “We are more technocrats, using machine sounds and lots of elements. There’s a lot to get right,” Squire said. Despite that, he said he doesn’t want people to just listen to their music. He likes for people to dance to it, too. “I try to think of both kinds of people when writing music,” he said. Yes has done so many songs over the years, Squire said he can’t pick one he likes to play the most. “They’re like children. I can’t pick a favorite,” he said. Squire also couldn’t pick a favorite performance. Squire said songs by Yes and other classic rock bands were all over the radio in the 1970s and ’80s, but stations don’t seem to play their newer music much. He was hoping satellite radio might pick up that slack, but it hasn’t. “There’s not an outlet for it. I’m the biggest fan of The Who but I couldn’t name one track off their newest album,” he said. Squire used to have a reputation as the wild man of the band, but that has changed now that he’s married and has a 5-year-old daughter. In the background Squire’s wife said maybe that’s why her husband hasn’t heard new music from older bands. “Our car radio has been tuned to Disney the last five years,” he said with a laugh.